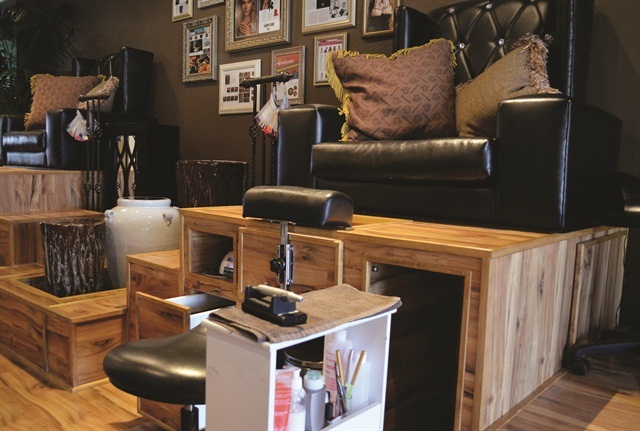 Bulky pedicure stations can often take up crucial square footage, especially for the mobile manicurist or small salon. Fortunately, these nail techs and manufacturers have found clever ways to cut down on wasted space. From custom-built pedicure thrones to stackable bowls that neatly tuck out of sight, there’s a space-conscious option for everyone. This compact and lightweight design is perfect for performing a pedicure just about anywhere — take it on the road or roll it up to any client in your salon. With no installation required, Continuum’s Pedicute includes an adjustable footrest with contoured footpads, a removable tub with disposable liners, three levels of heat, and an aqua massage feature. With help from his father, nail technician Christian Mans — the owner of Jeweled Nails in Lake Forest, Calif. — built custom pedicure units specifically with storage in mind. 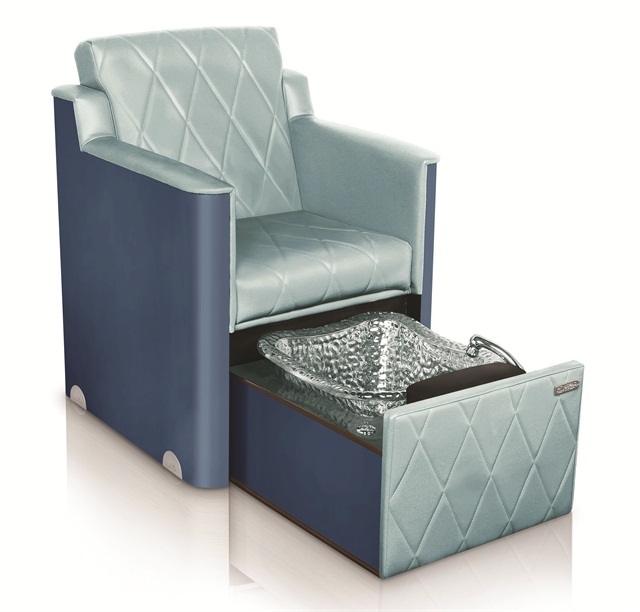 Pedicure chairs sit on handmade raised bases, each about 8-ft. long and 3.5-ft. wide. They feature a drawer for disposable liners and another drawer that can house up to 50 clean towels. A third drawer is for miscellaneous storage. 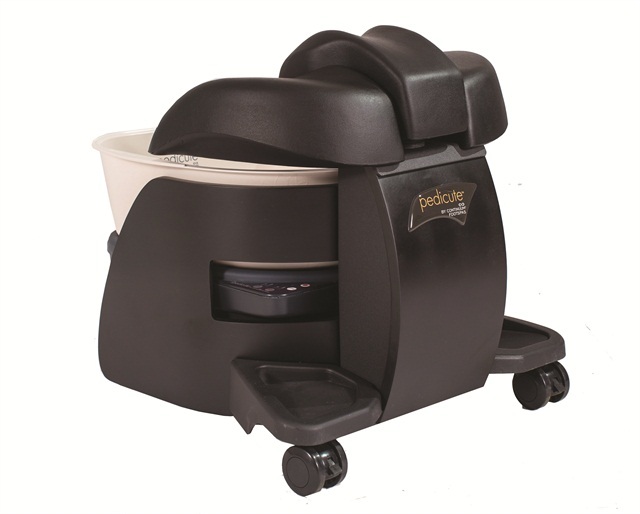 Pedicure carts roll directly into the base under the chair. There are also pullout notches for curing lights and wastebaskets. The units are made from wood and steel, and are covered with the same flooring used throughout the salon for a more “built-in” feel. 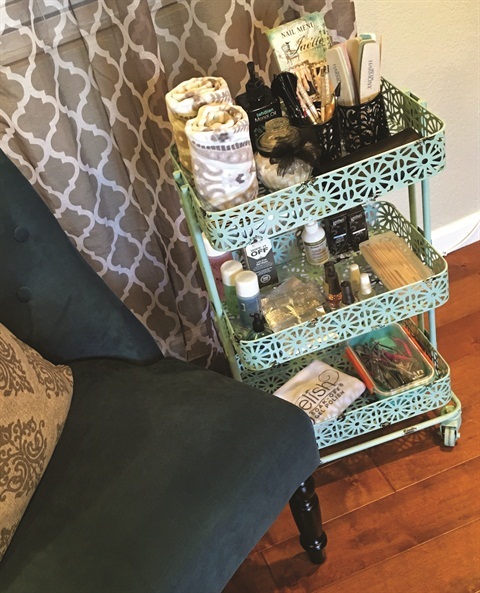 The Nail Truck, an Orange County, Calif.-based mobile salon, uses smaller, lightweight beverage buckets purchased from online restaurant supply sites. Salon owner Janine Allen says that due to their smaller size and shape, she can easily stack them and set them aside when they are not in use. “There’s not much room to waste on the truck,” says Allen. The buckets are insulated and double-walled to properly maintain temperature and are used with disposable liners. 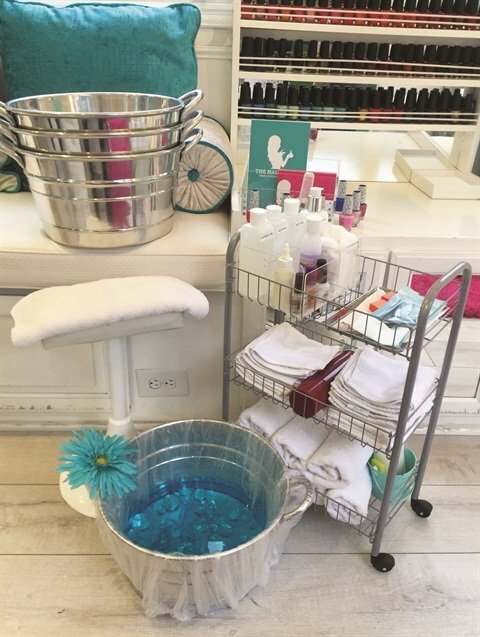 For the traveling nail tech, Noel Asmar created a Pedicure Bowl Carrying Case that can house a full-size bowl along with ­accessories. A zipper top and over-the-shoulder ­carrying strap allow equipment to be taken on the road or safely stowed away. 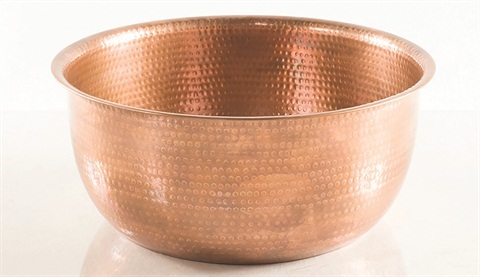 Resin and Hammered Metal pedicure bowls are lightweight versions of classic staples. With a contemporary look that will jazz up your decor, these bowls can be stacked and stored out of sight when needed. La Rosina is a compact and fully plumbed unit. The chair glides forward, easily concealing the pedicure basin and conserving space overall. When the bowl is stored underneath, the chair becomes a manicure station with an optional table that clips onto the armrest. The chair also features locking wheels for easy movement and vibrating massage on the seat and back.